Brilliant sunshine, grills sending delightful and savory scents of BBQ into the air, shrills of children playing and laughing, wind gently blowing, flowers blooming, people breathing in fresh air as they relax on their patio lounge chairs – all summer visions – cherished and loved every summer season all across America. The great outdoors is without doubt, one of the most valued places on earth, either at the summer house, cabin, or any backyard. Just like the interiors of our homes, the exteriors or yards, as of late, have gotten alot of decorating attention. More retail stores, websites, and malls, are selling outdoor wall art, statues, lighting, and accesssories that serve as mere artwork and decoration. Because of this trend, there are numerous reasons to love your yard again. Specifically, there are 5 reasons I love outdoor wall art. 1). Expression: By using outdoor art, anyone can create an outdoor canvas of self expression, just like inside the home. Wall art comes in many art forms – metal, canvas, plaster, wood, or glass. 2). Variety: Because the demand for outdoor art has grown, so has the variety of art work to choose from. One can find art themed after animals, flowers, the sun, abstract, birds, or even funny expressionalism. 3). 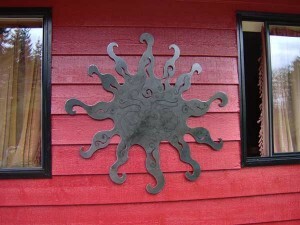 Cost: Outdoor art can be pricey, but most can be found with a friendly price tag. 4). Conversation Pieces: Anytime one entertains outdoors, which is a very popular trend, guests love to admire and talk about the outdoor art work. It gives others inspiration to purchase some for themselves. 5). Durability: Outdoor artwork is designed to be outdoors. It is waterproof, rustproof, and breakproof. It will last through all kinds of weather. Even when it is time for the flowers to bloom their last blooms, outdoor art will still be their to admire and add flair to your outdoors. Even just one piece of outdoor art will enhance a yard or outdoor space. Be clever. Be creative. Enjoy the great outdoors with your unique touch of wall art.